The American Revolution began on April 19, 1775, starting with the first shots at the Skirmish of Lexington, outside Boston. The result was a bloody day-long battle as the countryside rose up (thanks in part to Paul Revere’s Ride) and entrapped the British in Boston. Sixty days later, the British tried to break the Siege of Boston in what would be forever known as the Battle of Bunker Hill, on this day (June 17) in 1775. At the start of the Battle of Bunker Hill, the British arrayed themselves in two distinct wings. The British right was led by the battlefield commander, Maj. Gen. William Howe, while the British left was conducted by Brig. Gen. Robert Pigot. Few have seen the rare portrait of Robert Pigot, until now. Below is the beautiful painting of Robert Pigot, nowhere else published online, plus a little more about this important British leader. Following the first shots of the war on April 19, 1775, the British under Lord Percy fled to Charlestown. It was Robert Pigot that then relieved Lord Percy’s and his men so that they could cross back to Boston. Ironically, on April 20, Pigot and his men were then evacuated back to Boston, so that, sixty days later, on June 17, the British would again have to fight for the ground they once held. Assault 1: Pigot was to feint on the left, while Howe feinted on the right. The real assault was to be from an unseen column of light infantry, which marched along the eastern riverbank, hidden from the battlefield because the riverbank was below a small palisade. This light infantry column was to flank the Americans before the main British battle lines were to then attack the Americans. However, when the British light infantry marched up the riverbank they were decimated by a small party of Americans waiting there and thus retreated. This led Howe to turn his feint into a real assault on the American left at a rail fence, and he too was rebuffed. Pigot meanwhile, having always planned to feint until the Americans were flanked, never really assaulted the redoubt on the American right, though partly because his men were also occupied with snipers from Charlestown center. In response to this, the Royal Navy quickly razed Charlestown to the ground. Assault 2: As Howe was too arrogant to respect the American advantage, deeming them mere peasants and expecting them to give way before him, he and Pigot now attacked straight on against the American lines. Pigot’s left was still mostly a feint, waiting for Howe to break the American line at the rail fence and flank toward the redoubt. But the Americans did not give, and both wings of the British line were again rebuffed. The result, Pigot and Howe’s forces swarmed the redoubt, forcing an American retreat. (And in the retreat, Dr. Joseph Warren was killed.) The largely forgotten Brig. Gen. Robert Pigot was thus instrumental in the British victory at the Battle of Bunker Hill. Robert Pigot by Francis Cotes, c. 1765. Courtesy kind permission of Lane Fine Art Ltd., London, England. DO NOT REPRODUCE THIS IMAGE WITHOUT PERMISSION. The painting was previously held in the Pigot family, and thus has been unknown to historians until recently. 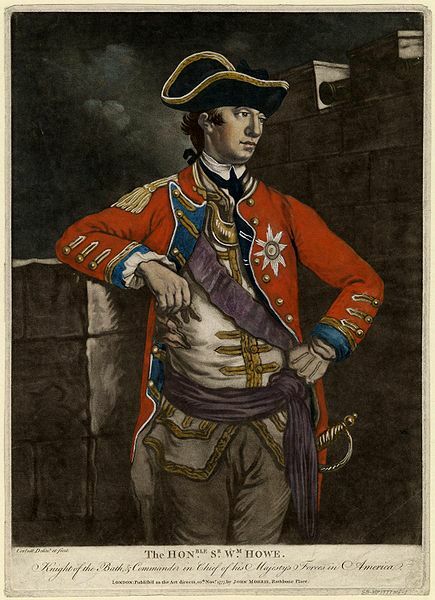 William Howe by Richard Purcell, 1777. Brown University, Anne S.K. Brown Military Collection. A plan of action at Bunkers Hill, on the 17th of June 1775. Between His Majesty’s Troops, Under the Command of Major General Howe, and the Rebel Forces. (Thomas Hyde Page). This version is of 1793 (an engraved form almost identical to 1778, engraved for inclusion in a history book of the Revolution), held at Boston Public Library (with edits by Derek Beck). Tagged artwork, bunker hill, research, showcase. Bookmark the permalink. One of the best succinct descriptions of the battle of Bunker Hill that I have ever read. Thank you for sharing the rare picture of general Pigot, who apparently escaped American marksmanship. Thanks! Maybe he escaped American marksmanship precisely because he was a “little Man” (see comment above). 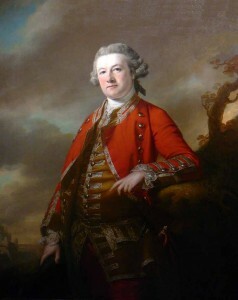 I just recalled this interesting tidbit: that Maj. Gen. William Howe, in writing to the British Army’s Adjutant General, Lt. Gen. Edward Harvey, in a letter dated June 22 and 24, 1775, describes Robert Pigot as a “little Man”. 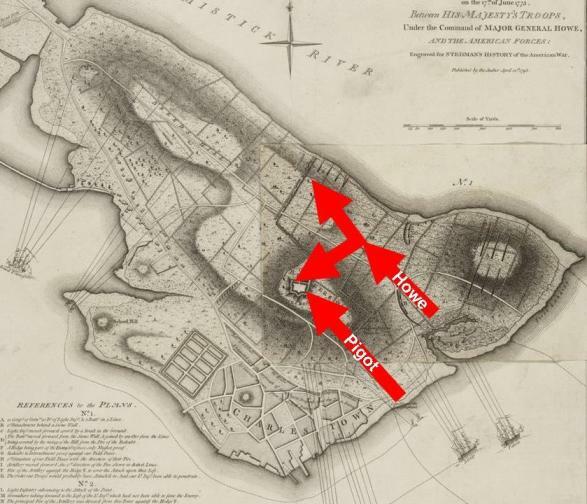 Do you have anything about Pigot in 1776 when e commanded Newport RI? I’m afraid I have not researched that part of the story…yet. Perhaps in a future book. If you find anything, please post back.